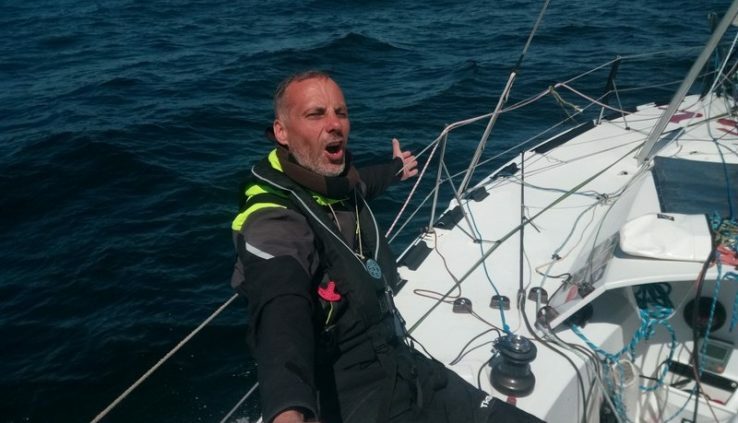 Fyodor Druzhinin join Irina Gracheva during a single transatlantic race in a 6.5-meter boat Mini-Transat La Boulangerie in October 2019. Druzhinin will perform in the division of prototypes and Grachev in the division of the serial Mini. Both yachtsman has fulfilled all the necessary requirements for participation in the final race of the regatta. In particular, in order to get to it, athletes must score 1500 racing miles. Experience Feodor Druzhinin was much larger than the minimum threshold: this season he walked more than 3400 miles during offshore races and 1100 miles per qualifying voyage. “Racing in the Mini class is a constant overcoming. Preparing for a race, in training, on the course, I feel like climb some mountain. It’s a constant work — whether it’s finding sponsors, repair materiel, or time on the water. Everybody’s always difficult, nothing is simple — there are no simple solutions and ready answers,” says Druzhinin. Speaking of difficulties, the yachtsman is not disingenuous. A vivid example is one of the most difficult races in 2018 , Les Sables d’olonne (France) — the Azores — Les Sables d’olonne (SAS), in which Druzhinin has participated in the preparation for the Mini Transat. Of the 54 participants, six dropped out of the race in the first stage, and two more are unable to reverse the route. The two boats then were all left by the skippers in the ocean. He Druzhinin during this regatta had cracked a rib. “During the first phase of SAS I fell badly and damaged the side — cracked rib, most likely. And the next day I broke the staysail. Try with a broken rib crawl over a 6-meter boat in 4-5 foot waves, trying to remove the staysail to repair. It’s really frustrating,” recalls sailor. That is why one of the goals Druzhinin for the remaining months is not only the improvement of skills in the management of his vessel, but also improve their own physical fitness. “I have two main goals for this winter and spring to add 5-7% rate of passing courses in strong winds and to increase their physical endurance. Without this the results will not be” — explains Druzhinin, who intends next year to enter the top ten ranking of the Association of Mini. To participate in the Mini-Transat it will be on the boat RUS 759 ASSIST by Sam Manuard design, made of carbon fiber and Nomex. “This is a unique device, very complicated — all it for me, especially swinging from the keel to the inclined swivel mast-wing. I went on 759 m already almost 5000 miles, but I still continue to learn to race on the “proto”. The main challenge for 2018 was to improve the gliding of passing courses in strong wind. I had the boat in the weak and medium wind dispersed it on ricing, but when the wind is 20 knots from the veterans class and experienced shortnotice leave me behind,” says the Russian. After breakage during the SAS ship serious repair. With the help of sponsors it has become possible to upgrade materiel: power system, sensors, anemometer, GPS systems HF, ultrasonic lag, as well as all deck equipment, tackle rigging and sails. Training on the new boat athlete hopes to begin in February. “Thanks to them (sponsors, approx. itBoat) is huge: in September, the financial Outlook for the project looked very bleak, now with the help of project partners, we began almost to meet the required budgets. But before the complete financial stability of the project is still very far away — now it’s an endless black hole, which absorbs all the resources,” says Druzhinin. But there is one important thing that none of the future members of a single offshore races can not buy for any money. This is psychological stability. “All relieve emotional tension in different ways. On my boat, for example, I found a neatly taped and spackled holes in the input hatch. One of the early skippers on the third day of calm slightly damaged in mind and handle from the winch began to spread all that came to hand. When you find yourself in an emotional pit at the second week of the single race is really hard. You need to learn to overcome it. Otherwise, you can not just reach the finish line,” says sailor. It is hoped that the new owner ASSIST will be persistent and will successfully perform in the Mini-Transat, the participation in which he dreamed of for 20 years. On Board the "Gene machine"